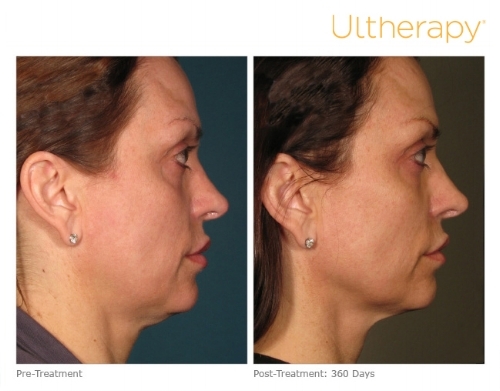 Ultherapy harnesses the power of ultrasound to lift and tighten the skin naturally—without surgery or downtime. Ultherapy relies on ultrasound therapy to deliver its collagen-boosting treatment. It also incorporates traditional ultrasound imaging, which allows practitioners to see the layers of tissue they are treating, ensuring the treatment energy is delivered to where it will be most beneficial. Ultherapy is the only non-invasive procedure FDA-cleared to lift skin on the neck, under the chin and on the eyebrow. Now also FDA-cleared to improve the appearance of lines and wrinkles on the décolleté. Ultherapy can help you achieve a fresher, more youthful look from your brow to your chest!